State-of-the-art teaching and research facility will enhance inter-disciplinary collaboration and encourage community connections. Integrated, high-performance design supports the University’s highly progressive sustainability agenda. 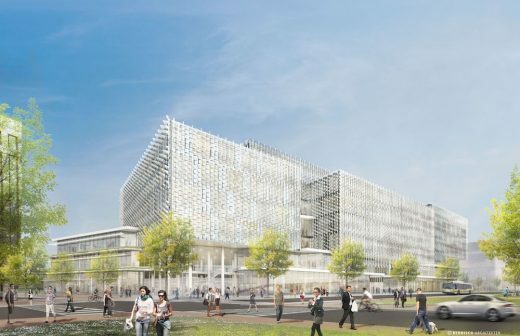 The proposed Science and Engineering Complex (SEC), located on Harvard University’s emerging Allston campus, integrates one of the country’s most diverse and exciting engineering programs into a single 497,000-square-foot structure. The new facility establishes a strong precedent for the development of outdoor space, street activation, and integration with larger public space networks, as described by the University’s Institutional Master Plan, which was approved in 2013. 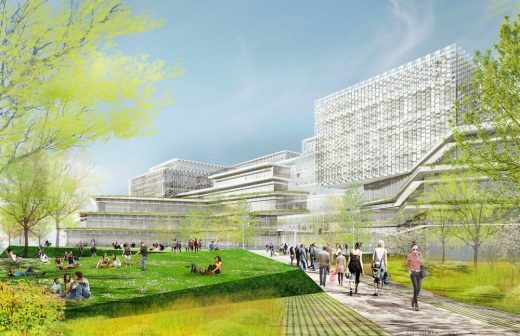 Set to be built on top of the existing foundation of a previously-designed life sciences complex that was suspended in 2008, it will accommodate teaching and research laboratories, classroom space, faculty and staff offices, and a host of amenity spaces. 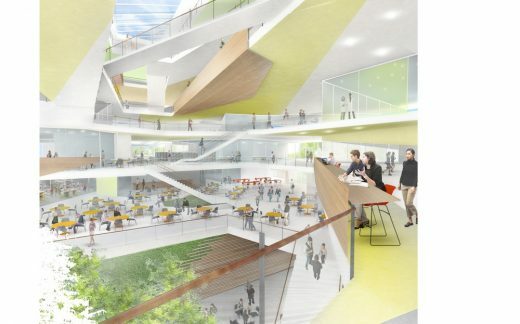 As the primary home of the John A. Paulson School of Engineering and Applied Sciences (SEAS), the state-of-the-art complex defines a new series of environments that support SEAS’ profound commitment to interdisciplinary collaboration both in teaching and research, and exploits these qualities to create vibrant public spaces at a variety of scales throughout the building. The SEC stretches more than five hundred feet along Western Avenue and is situated on the northern one-third of the overall site. The massing of the building forms a new landscaped courtyard space suitable for outdoor recreation and events towards the site’s center, while the balance of the site to the south is preserved for future development. The building is expressed as a series of floating, highly flexible research boxes above a two-story transparent plinth comprised of the more public, active elements of the program. This plinth adopts an architectural language of terracing elements as it reaches south to define the courtyard, establishing a building scale that respects the adjacent residential fabric. Organizationally, the building follows the massing logic, with classrooms, teaching labs, and amenity spaces occupying the lower plinth floors in order to take advantage of proximity to the street and courtyard, while research labs in the upper volumes maintain appropriate levels of solitude and security. Additional teaching spaces, fabrication shops, core research facilities, and a loading dock occupy the below-grade levels. All six above-grade and both below-grade levels are connected vertically by a central atrium space facing south toward the courtyard, which delivers daylight to all floors and serves as the communicative heart of the complex. Smaller distributed atria punctuate other areas of the building away from the atrium and define more local neighborhood groupings. The façade design calibrates the scale of the SEC, creates an identity for the complex, and plays a crucial role in the energy performance and occupant comfort in the building. On the two lower floors, highly transparent glass ribbons open outward toward the public realm and are shaded by the deep overhang of the slab edges and by supplementary light shelves, which also serve to reflect daylight deeper into the building interior. The upper research boxes are sheathed in a sophisticated screen enclosure that unifies the volumes visually while masking the overall scale of these elements. Depending on its orientation and solar angle, this screen is precisely dimensioned to shield the building interior from solar heat gain during warmer months while it lets beneficial sun in during the winter, thus significantly reducing cooling and heating loads on the mechanical plant. The screen is also calculated to reflect daylight towards the interior while maintaining large view apertures to the exterior. The central atrium and the major entries have multi-story all-glass façades that are shaded by integrated roof planes at varying heights. All three façade systems incorporate operable vents for natural ventilation and require stringent levels of thermal performance to maximize energy savings. In addition to the performative quality of the facades, the SEC integrates a highly progressive sustainability agenda. Ventilation rates, typically the strongest driver of laboratory energy consumption, are being scrutinized as part of a comprehensive risk assessment to determine appropriate air flow for all spaces in the building, with the goal of reducing ventilation rates by as much as one-third without sacrificing occupant safety. All outside air brought into the building is run through whole-building air cascade, which allows the same quantity of outside air to be conditioned and reused as many times as possible within the building before being exhausted. Exhaust air is directed through a high-efficiency heat-recovery system, allowing waste heat to be recaptured and reused with incoming fresh air. In non-laboratory spaces, a comprehensive natural ventilation system circulates fresh outdoor air throughout the building interior without the need for energy intensive fan systems. Hydronic heating and cooling systems, which utilize as little as one-third the energy of comparable air-driven systems, are deployed extensively in order to provide efficient, silent, and draft-free tempering of interior spaces. Building atria in combination with highly glazed interior partitions transmit daylight deep into the building footprint. User-controlled lighting and natural ventilation systems are given priority, in order to allow the individual to establish his or her relationship to the environment. Water walls and vegetated zones are being studied in order to enhance comfort within local climate zones. The design of the Science and Engineering Complex project pulls together a number of threads of contemporary life, which will certainly influence future generations: engineering’s decisive influence on the discovery and resolution of some of the world’s most intractable problems; the critical importance of cross-disciplinary efforts to achieve major research initiatives; and genuine leadership in the area of sustainable design and urban development.